Discover the Twin Drivers of Success to learn English faster in episode 13 of the Power Learning Podcast! In this episode of the Power Learning Podcast, I discuss how to see rapid improvement in your fluency by using my Twin Drivers of Success technique. With this unique approach to success, you’ll be constantly motivated, always have something to work on, and will reach your English fluency goals much faster. Enjoy the episode and be sure to take action! Hello, and welcome to episode 13 of the englishanyone.com Power Learning Podcast. It’s a pleasure to have you with me. 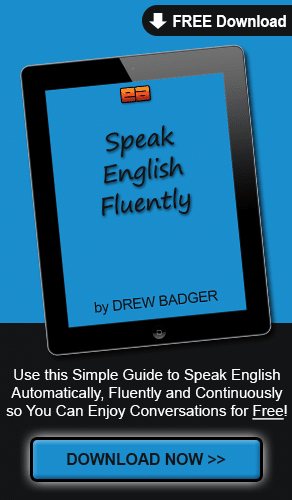 I’m Drew Badger, the Co-Founder of englishanyone.com, I’m an author and English speaking confidence expert, and welcome to the program. We’ve got a lot of great things planned for this episode, so I hope you’re ready to sit back, relax and learn something, but then go out and actually take action with what you learned today. Our four winners of the Master English Conversation Scholarship Contest are doing extremely well. I’m really excited to hear their recordings every month, and then I will be revealing their progress a little bit later, uh, in the coming months when they’re all finished with their full year in the program. So you can see what their progress has been like, uh, and you can honestly see what it’s like to go three Master English Conversation, uh, from four people that have done it themselves. Uh, also, one of them is taking the IELTS exam next month, so I’m really excited, uh, for her progress, uh, and to see what happens when she takes the test. So hopefully we’ll learn more about that. First of all, uh, I just wanted to say thank you to everyone, uh, who gave, uh, some shout-outs. These are, uh, kind of kind words, uh, of support and hello. I was, uh, battling a few different illnesses. I went to America for Thanksgiving. I had a fantastic time. Uh, I had, uh, Thanksgiving with my family, plus a whole bunch of people, uh, and I was actually doing a lesson with my dad when I was down there, which I’ll be using in Master English Conversation later. Uh, but we were talking about how our Thanksgiving is always very different from the kind of normal, typical Thanksgiving that most people experience, so I thought it would be interesting to tell you about it in this episode of the podcast. Well, usually what people do for Thanksgiving is it’s the kind of immediate family, so maybe the mom and dad, and the kids, and maybe the grandparents, and cousins, and other people, usually gather together to have a meal. And it’s kind of an all-day eating affair, lots of family and friends, they come, uh, to celebrate Thanksgiving. And this is, uh, at least kind of one-sided in American culture where we describe the Pilgrims, the people that are coming to America for the first time, uh, they needed the help of the local people that were living there, and this is kind of the story of Thanksgiving. So we survived and learned how to grow food as a result of working with people that were living on the land already. And so we get together and celebrate that. But what we do at my house for Thanksgiving, uh, is we have a whole bunch of international lawyers that come to the house. So we have, um, you know, students from Japan, from Korea, and Indonesia, the Philippines, all kinds of countries. People from South America, and Europe, lots of people from all over the place. And it was really great coming back after not having been in America to see that for ten years, and now I’m the same age as all of these people, so I can sit and have lots of great conversations. So I was able to meet lots of great speakers, and hear different accents from people from all over the world. And that’s the Thanksgiving that I’m always known, so it was a pleasure to be back for that. Uh, I also went to a friend of mine’s wedding, and I was really excited to do that. The only problem is that I was so busy, and I didn’t sleep very much, and I had a little bit of jetlag. So this is the, uh, experience you have when you travel, uh, by a plane and you’re going many, many hours to a different time zone. So going from America to Japan, it’s almost not quite the opposite side of the world, but it’s pretty far away. And it took my body a little bit of time to get used to it, so that after I’m getting used to it I return back to Japan, and I’m, uh, still not feeling very well. And I had to carry some heavy bags, and I got kind of sick while I was doing that. So it took me a few days to recover, but I’m back and feeling quite healthy now. The only problem here in Japan is that now it’s turning into winter, so the houses are, uh, quite cold. So I’m sitting in front of a heater right now, actually, making this recording for you. Anyway, uh, it was a fantastic Thanksgiving, but it’s great to be back here in Japan and to be making more lessons for everyone. Well, getting into this tip for this month, to follow along in the progress of the Master English Conversation Scholarship Contest winners, uh, as you’ve noticed, if you’ve been listening to all of the podcasts episodes, we’re getting more and more specific with the tips, and it becomes an individual thing for people to work on. When you’re first starting out learning a language, the teacher has a very big role in how you make progress, and how you’re learning things. But, as you’re learning, uh, it becomes more of the student’s job to find their own way, because each student has to come up with their own individual things that work best for them. Uh, and an individual teacher can work well, um, you know, if I’m working with someone on a one-on-one basis, but what you really need to do to, uh, become a fantastic learner is to take control of your own English education. I can provide lots of tips, uh, and do my best, even if I’m working with you personally, but the best thing I can say is that you try lots of different things and you see what works. We only have a few months left, I believe, of the full year that the Master English Conversation Scholarship Contest winners have, so they will continue with the program. Uh, but now I really want them to focus on what they can do individually, and again, uh, anyone listening out there, what you can do to improve your English, by, number one, thinking about trying new things and trying different things. So maybe you learn, uh, listening in one way, or learn vocabulary in one way. If it’s not working, then you can switch up and try something different. So you have to depend more on yourself, and your own thinking. So you have to think more for yourself, and that’s what I try to get students to do. So, what I’d like to talk about today, uh, because we’re getting more specific, and this is really something that the winners and yourself, everyone listening out there, needs to think about, and these are the twin drivers of success. And the twin drivers has really nothing to do with language learning specifically, you can use it for anything, uh, but it’s something I like to use, it’s a technique that I use, uh, that really helps me when I’m studying something, or learning something. It could be business, it could be a sport, anything else like that. Now, many times you will hear the advice to focus on one specific thing. Uh, but when I’ve kind of thought about that, and tried using that in my own life, it hasn’t worked out so well, because you can get burnt out. Uh, this means that you’re getting kind of tired of doing something, you don’t really want to do it, or it’s just not so exciting anymore. You always have to have a little bit of something new, a little bit of change in your life, in order to have a lot of energy to try something new and to succeed. So, instead of focusing on one thing, I recommend students have twin drivers of their success. So not just one thing you’re focused on, you have two things that you’re working on that kind of work together to help you get to where you want to be. So in the case of learning English, one of these things could be learning, uh, or kind of focusing on grammar, and the other could be focusing on improving your pronunciation. Now, it’s a twin driver, and not just two separate things, because they’re interconnected. You can’t really improve your grammar without also having to speak and use, um, you know, pronounce words properly. And, by the same token, in the same way, you can’t really, uh, work on your pronunciation without speaking and learning to blend the sounds of words together. And when you do that, you have to practice using them in a grammatically correct way. Now, the benefit, uh, and there are many, of having the kind of twin driver approach, or the twin focus approach, is that if you’re focusing on just one thing, again, as I mentioned before, you can lose focus and you can get distracted and bored by that thing. But if you’re, let’s say, one day focusing really hard on grammar, and then after a while your brain gets kind of tired, you can switch and start focusing on the pronunciation instead. So all of these things, uh, or the two things that you’re working on, again, they are connected, but if you’re focus on just one, you can get bored by that. So I highly recommend you take two things that you’re working on. One can be a thing that you’re strong in, and another can be something that you’re weak in, and then you kind of support both of the, uh, the learning of those things, uh, with each other. So let’s say I’m trying to do the grammar and pronunciation, uh, twin driver focus. And I’m working on some grammar point, and it becomes really frustrating, I’m trying to learn it in a couple of different ways, but it…it still doesn’t stick for me. I can take a phrase from that, like an example sentence, and just practice the pronunciation and not focus on the grammar part of it, but I focus on the way the words sound. I’m focusing on the same thing, but because I’m looking at it in a different way, it helps me to take my mind off of the grammar. Even though my mind, my kind of subconscious mind, is still focused on that grammar, but it helps me to remove my mind from that, and focus on it in a different way. So, again, let’s say we’ve got a phrase like, uh, I went to the store yesterday. I went to the store yesterday. This is just a simple past sentence where I went to the store. So I can, let’s say, if my English is very basic, and I…I’m having trouble, ah, I goed to the store yesterday. Ah, it’s just really difficult for me to remember that. Or other, um, irregular verbs that have the past tense that changes in a funny way that I’m not used to. So even though this is a basic thing, I might be having trouble with it. And instead of worrying about the actual grammar side of it, I can focus on the went to, and worry about or focus on blending that together. I went to. I went to, becomes I went to. I went to. And as I worry or focus about, uh, focus on the pronunciation, the grammar starts to be absorbed by my brain automatically. So I can stop focusing on that, but still focus on it in a roundabout way, or a, uh, kind of connected way. And, again, this is the whole function of the twin driver system. So the twin driver system, again, you can take one thing that you’re really good at, and push forward on it easily, and then use that to pull yourself, uh, with something that maybe you’re not so strong at. So if you really like pronunciation but you struggle with grammar, then, you know, try to create sentences that let you practice the blending of sounds. You can listen to native English speakers, uh, that are speaking in real, actual situations, like we make for englishanyone.com, or you can find them anywhere. I recommend those, again, situations that have real speakers in real contexts and not movies, uh, because the people that are speaking in movies have a scripted way of talking. So you’ll learn a lot of great phrases from that, and a lot of cultural things from movies and TV shows, but it’s still not the same natural way with all the mistakes, and the ums and uhs and things like that, that come from actual natural native speech. So pick something that has natural native speech, and listen to it, but you practice just listening to the blending of the sounds. Listen to how the…how the language sings. Listen to the melody of the language. And that will help you, you know, not only focus on improving your grammar, but you’ll really get to improve your pronunciation at the same time. So, again, this is the whole thing, uh, about the twin drivers. So, again, the two things are supporting each other. You can work on one that’s strong, while the other is weak, uh, and if you get bored with one you can tackle the other while you’re working on that. It will also help you judge, uh, how you’re improving with one versus the other. Because a lot of times, if you’re just focusing on one thing the whole time, it’s really difficult for you to see where you’re going. And it was interesting for me when I went back to see people, and even see the area. I’m from Hyde Park in Chicago near the University of Chicago. And if you’re living there, the subtle changes, or the…the slow, gradual changes that happen to a neighborhood, they’re not as visible to the people living to there. You’ll notice them, but it’s much more obvious if you’re a person that has not been there for many years and you go back and you get to see them, and everything has changed, uh, and everything that’s different is very obvious. So if you’re only focused on one thing, and you’re trying to do that, you can push yourself too hard, and you won’t be able to see your progress as well. So, again, there’s just…there’s really a lot of great ways about, uh, the twin driver way of working on something. So it just depends on you personally, what you really want to focus on. And you can focus on any two things you like, but make sure that there’s a connection between those two things. And for pretty much everything in life, there is a connection of some sort. You could do learning English and doing gardening, or whatever. Uh, it doesn’t really matter what that thing is. But for you, you need to find that connection. So decide what your two things are, decide what your two drivers are, the two drivers of success, and focus on one of those things until it gets difficult, or boring, or, you know, you’re not feeling the success flowing as smoothly as you’d like. Then you can switch over immediately to the other one, and push forward on that, so that when you return to the original thing, ah, it becomes much easier to understand, and you’re a lot more excited to continue, because you’re always having a sense of progress, and a sense of success. So as a teacher, I’d really love to continue to give you more specific things that you need to do with your English, but at the same time, uh, I’m…I wouldn’t be as good of a teacher if I told you exactly what to do. I want to open the door for you to go out and see success, and, honestly, you feel a lot more success if you have, uh…kind of you are the one that’s creating that success. If you are the one that’s deciding what to do and taking action because of that, and not just hearing something from a teacher, then you feel a real sense of empowerment. And that’s what I want for you. So, for the four winners of the Master English Conversation Scholarship, and for everyone else out there, find your two drivers of success, go out, uh, and focus on one of those things, practice with it, and then switch to the other one when you’re having problems, and then that will help you really see lots of improvement and success in your English learning. The last thing I’ll talk about today is something that I mentioned, uh, in, uh, a letter recently to my Power Learning Subscribers. 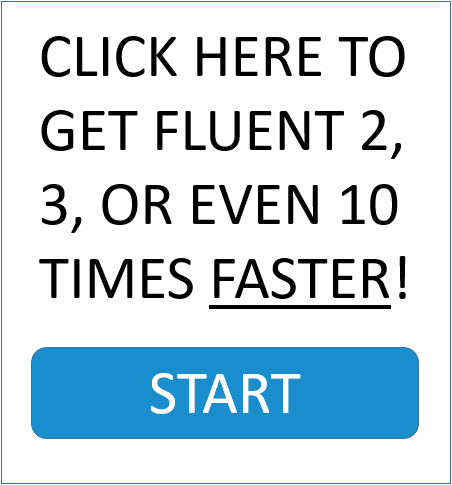 This is a free video course, plus, uh, well that’s…we’ve got lots of videos in the program, actually, that’ll help you build your speaking confidence, um, explain why English is such an important thing to be learning, uh, and actually go through a lot of the tips that I use to make Master English Conversation so successful for members. Uh, it also has a…an e-book where I’ve just released that’ll help you meet other native English speakers that you can practice with online. But part of…kind of the biggest part, really, of Power Learning, is the emails and the newsletters that I send out to members. So these are the really personal things…you’ll notice, maybe if you go to the englishanyone.com blog, there really isn’t much on there, because all of the really good information I give, um, is for kind of my personal but free members. So if you are not a Power Learning member yet, I highly recommend you subscribe. Uh, but anyway, so this, what I’m about to talk with now, is something that I was explaining and revealing to Power Learning members not that long ago. Now, when I came back from America, and I was feeling sick, I had come back and I was excited to work, but my body just…just would not let me. I was really too tired, uh, and I was too exhausted. I couldn’t really sit at the computer, I couldn’t do much, uh, so I would sleep for a little while, but, uh, my stomach hurt, and my back hurt. It was funny, actually, I…I would watch some Japanese TV sometimes, you know, just to practice my Japanese, but, uh, all of the TV shows, so many of the Japanese TV shows, feature food in some way. It’s a really big part of the culture out here. Uh, and so any time I would watch those, I would be really, you know, I…I would be kind of angry, because I wanted to eat, but I couldn’t, so I was hungry, but my stomach was kind of hurting too much. So I started watching ice skating, which I don’t really do. I’m not really a big fan of ice skating. But there’s no food in the ice skating, so I was really excited to watch that. Uh, and, uh, two of the Japanese skaters had won, I believe, and they were…they were doing really well. So I was excited about that. Uh, but the interesting thing that I really noticed from being…we call this incapacitated, and this is to not be able to move or to do something that you want to do. And the interesting thing I realized from being incapacitated, is that, you know, the internet is something that it’s…it’s a huge part of my life. It’s a way I connect with people, especially because I’m not in America, so I can connect with friends and family. But it’s also the way I connect with you. Even the way I’m speaking to you right now, I can be sitting in my apartment in Japan, but you could be in Brazil, you could be in Argentina, you could be in, um…you know, you could be in Norway, or Finland, you could be anywhere in the world, but we’re able to connect with the internet. And I spend lots and lots of time on the internet and on the computer, working on things and creating videos, and so I felt that it’s…it’s such a strong part of me that when I wasn’t able to do it for like two days, I was really stressed out about that. And it was difficult for me to really get to the point where I was comfortable not having that. And the interesting thing was about…about a day and a half in, or maybe like a…a day, almost the first day on, uh, to not being able to do anything, I relaxed, and my body began to adapt. So I started reading more, uh, you know, I would find other things to do, because I couldn’t really sit and do any work on the computer. And I’m usually a very busy person, I like to be active and working on things, and building something, so it was difficult for me. But my body was very quick to adapt, and by the second day I didn’t feel like I needed the internet as much. And I will probably go back to that, uh, go back to that feeling of the internet being very, very important, uh, as it is, but the interesting thing that I want to share with you, and the thing that I shared with Power Learning members, is that I kind of created a diet for two days where I focused, uh, not on what I normally do, but created almost a completely new lifestyle incredibly quickly. So what I asked Power Learning members to do is to think of their own two-day diet where they can think about something that they’re doing right now, and then to try to change it or do something in a completely new way to shock your body. Now, do something that won’t hurt you, and don’t do it for too long. The reason I told people two days is because if you do it for three days, you know, people might wonder where you are, especially if you stop using the internet. You know, maybe my mom would get worried, or something. But what you can do is, like let’s say you really love to read books. I want you to stop doing that completely. Don’t read anything for two days, and go out and try to do something completely different. Watch a movie, or go out and just talk with some people. And just really try to shock your body into doing something different. Your body will get into natural habits, and your brain actually stops thinking when that happens. So you begin doing something every day and you stop thinking about it, but when I was adapting my body started thinking more, and I really had to think about what…What am I going to do today? And…Well, since I can’t, you know, I’m not feeling very well and I can’t do anything on the computer today, what else can I do with my time? So I start, you know, talking more with people, uh, that are around me, and, you know, reading books, and having more kind of different things in my life during that period. But because of the two-day diet, I’m able to shift in a new way of thinking after the diet is finished. So now that I’m feeling better, I can find something, uh, that I’m interested in, uh, but still have that balance where I’m able to work on things on the computer at the same time. So these two things, the things that I’d like you to think about for this episode, the first one is the twin drivers of success, so find your two things, but the other is I’d like you to try a two-day diet of some kind. If you’re learning, and you always study in one room, find a completely different room to study in. If you’re liking to sit, you know, outside, and you like to do things inside, go inside and try to build like a model house, or something like that. Just do something completely different, not only for your learning English ability, but also just to get your mind thinking, and to wake yourself up. It’s a exercise in shocking your body. So, you’ve got a lot to deal with for this month, and I hope you really enjoyed this episode with me. If you’ve got any questions, or ideas, or anything that you think would be helpful, uh, two-day diet ideas, especially, or twin driver examples, comment down below this video, either on englishanyone.com, or on YouTube, wherever you’re watching or listening it. And I really look forward to speaking with you soon. Have a fantastic day, think about your twin drivers and your two-day diet, and I will see you next time. Bye bye.